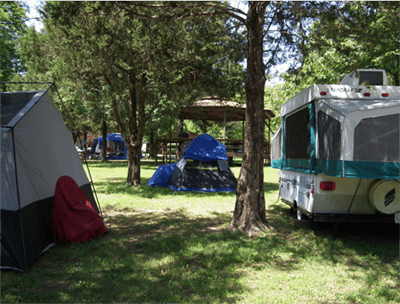 The Bar M Campground is one of the nicest small, family operated campgrounds and RV parks on Table Rock Lake. We specialize in making campers comfortable with full hook-ups, level sites, spotless showers, and every amenity of our resort is at your disposal. The Bar M Campground is conveniently located just minutes from all the famous Branson attractions, but offers full access to Table Rock Lake. Our Table Rock Lake campground has a beautiful swimming pool with water slide, a large family size hot tub, a game room with pool table and video games, a large playground to safely occupy the kids, both 7 and 10 foot basketball goals, horse shoes, our own private boat dock and launch ramp and even a variety of boat rentals. You can enjoy all these amenities and still enjoy all the Branson attractions too.